My Purgatory Blog: The Walking Dead: Guess Who's Back?! Admit it; you think I'm hot. Spoiler Alert: I have watched 6 eps of season 4. 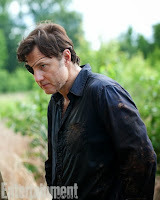 OMG I cannot BELIEVE how much I love the Governor now! I HATED him! And now he's fantastic! I love his little wanna-be family and his relationship with his new "daughter". OMG I will be so mad at Rick if he kills him!! I really thought I'd be bored with a full ep about the Gov...but it was just the opposite! Which says a lot about David Morrissey that he can carry an entire hour! And is it me? Or is he all the sudden...kinda...hot?? I really have nothing more to say about ep 6...except that the gov's girlfriend's almost-cop sister - aka Alanna Masterson - aka redhead dude from That 70s Show's sister - looks like Camilla Belle. I'm thinking this character has some skells in her closet. We'll see. Here's a trailer for next weeks' ep. Can't WAIT!!! OMG did you see last night??? Still have to post about that! I don't know WHAT to think!!!! I loved him last week but now I'm really sceeved!! !